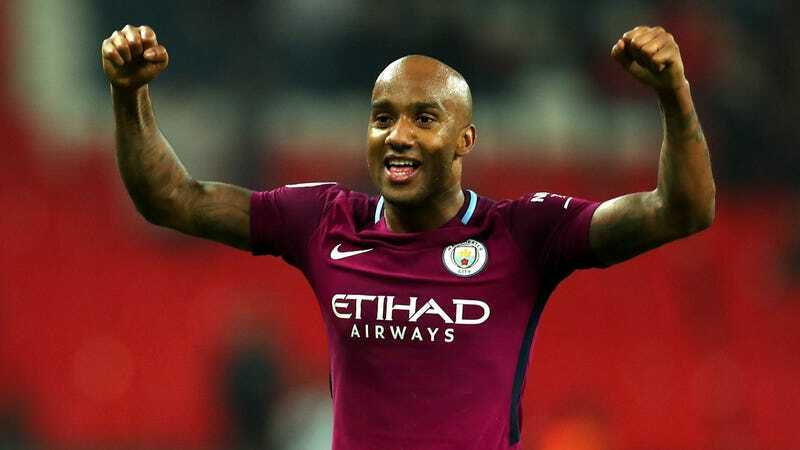 Fabian Delph celebrates after Manchester City’s win. Manchester City is one of the best teams in the world. City is running away with the English Premier League this season. But the last two weeks have been one of the worst for City in recent memory. City lost three straight in the last two weeks: Twice against Liverpool, which knocked City out of the Champions League with 3-0 and 2-1 wins. Those losses were sandwiched around a 3-2 loss to Manchester United, a match where City led 2-0 at halftime and dominated possession. City has won 28 of its 33 Premier League matches this season. The start of April was not good. Today, City returned to form. As such, it is just three points away from clinching the league title after a 3-1 win today over Tottenham Hotspur at Wembley Stadium. City could clinch as early as tomorrow. City went from scoreless to up 2-0 in just three minutes. Gabriel Jesus, the 21-year-old forward, buried a shot after a long ball from Vincent Kompany in the 22nd minute. Three minutes later, Ilkay Gundogan buried a penalty. Raheem Sterling was outside the box when he was fouled, and so Liverpool’s 2-1 halftime deficit could’ve been 1-1. City is just three points away from clinching the league. A clinch could come if Manchester United lose to West Brom tomorrow. That’s unlikely, so next week’s home tie against Swansea will likely be City’s championship clincher.